Inventory management software is designed to help businesses track product levels, sales, purchase orders, and incoming stock. It should integrate with accounting software to create seamless workflows, and reports to show you the health of your business. The best inventory management software pricing for small business varies from free to $500 per month. We looked at features of inventory management software from the perspective of a warehouse manager, manufacturer, and retailer managing inventory for a single small business. Not only should the software be easy to use and relatively affordable, but it should also include the basics of inventory management, such as bar coding, inventory alerts, reordering, sales tracking, and integrations. On the more advanced side, we looked at features like bin tracking, forecasting, and bill of materials. The list of inventory management software options we’ve chosen should serve most small business needs. For most small businesses, the best inventory management software is Zoho Inventory. It offers a complete set of tools for any retailer that needs to track inventory, manage a small warehouse, and keep sales going and inventory moving. Zoho’s many available integrations make it possible for you to manage a business, including shipping, ecommerce, and retail channels, payment gateways, and accounting. Plus, it’s free to get started. Zoho Inventory helps you track inventory and sales, manage shipping and purchase orders, and even kitting solutions. It’s surprisingly complete inventory management software for its low price, making it a great option for any small business, online or off. There’s a free plan, but for high-volume sellers, you’ll need to choose a paid monthly plan. Pricing for Zoho Inventory ranges from free to $199 per month if paid annually, or $249 per month if paid month-to-month. The low-priced plans work well for smaller businesses with only one warehouse to manage. If you find the limit of orders is too low, you can add on 50 orders per month for $5. Also, if you go with the highest-priced plan and exceed the 10 warehouses allowed, you can add another warehouse for $9 per month. Unless you choose the free option, you can manage multiple warehouses using Zoho Inventory. The benefit here is that you won’t have to switch between applications or accounts to manage multiple locations. Plus, if you have warehouses strategically located, you can choose from which warehouse to ship an item to a customer, saving on time and shipping costs. Your inventory updates in real time across all locations, so you always know what stock you have on hand. Zoho Inventory allows you to choose from nearly 30 different shipping carriers, so you can pick whichever one works best logistically or financially. You even get shipping labels with your monthly plan, saving you more money and adding convenience. One of the key features of any inventory management software is how you can control inventory. Zoho Inventory lets you go granular with the details of each item. With its new composite feature, you can use a workaround to create bundles, or mimic kitting and bill of materials, to help you track parts for assembly of an item. However, you only get batch tracking and serial number tracking with the Standard and Professional plans. You can also set your reorder levels, and then create automated rules for reorders, so you only ever run low on stock, not out, but you’re limited to five automated workflows in the Free plan. View sales, inventory updates, purchase orders, and best-selling products on a single dashboard in Zoho Inventory. Perhaps one of Zoho Inventory’s best feature is its ability to integrate with several other applications and marketplaces. If you sell on eBay, Amazon, Etsy, or through Shopify, you can connect. Plus, Zoho Inventory integrates with various other Zoho products like Zoho Books and Zoho CRM, so you can manage every level of your business. It also integrates with various payment processors like PayPal and Stripe and collaboration tools, such as Slack. The one glaring omission from Zoho Inventory is its ability to integrate with other popular software you might prefer using, such as QuickBooks for accounting and bookkeeping. Also, there’s no formal forecasting with Zoho Inventory, which is vital. The dashboard shows your best-selling products and an at-a-glance view of stock, purchase orders, and sales. In Zoho Inventory reviews, users typically strip it down to the core of why they like this software: It makes organizing, tracking, reordering, and managing inventory easier. It’s also scalable as you add on new warehouses for distribution, people have noted. However, Zoho Inventory doesn’t work well for specific industries or a particularly large catalog of products, some customers have said. Also, you might have to use the Zoho community to help find workaround any missing functionality. Zoho Inventory offers simple inventory management software that can help you at all stages, including entering, tracking, reordering, shipping, and reconciling if you add on the Zoho Books module. It’s an affordable and easy-to-use solution for small retailers who expect to grow and want software that will scale. Get started for free today. Lightspeed Retail is more than inventory management software as it’s primarily POS software, but it’s known for having robust inventory control and excellent prebuilt reports. It’s an easy-to-use, affordable option that’s geared toward the small retailer in a brick-and-mortar shop with varied inventory. Pricing for Lightspeed Retail starts at $99 per month if you pay on an annual basis. If you need more than one register for your shop or more than five users to help with inventory management, you can contact Lightspeed reps to get a custom quote. Add-on features include ecommerce for $59 per month, which allows up to 250 products, and a loyalty program at the same price point that offers marketing tools and a rewards program. At the top of the list for Lightspeed Retail features is inventory management and for good reason. You can import inventory from a spreadsheet easily, add several variants to each product, and include serial numbers. 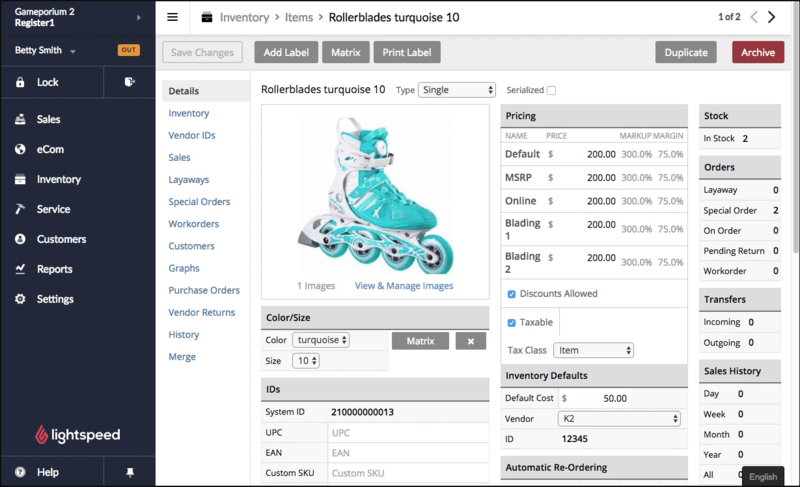 There’s also purchase order management, and you can set up reorders with Lightspeed Retail’s integrated vendor catalogs. 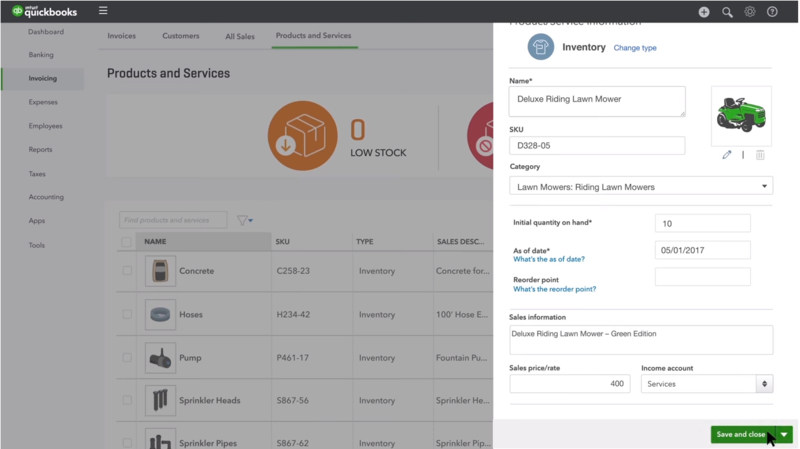 The inventory management software part of Lightspeed Retail seems rather basic, but it’s done well, making it one of the best inventory management software solutions. Import data from a comma-separated values (CSV) file or add inventory one by one. The variants are helpful for you to get down to granular descriptions, which can help with searches. If you have more than one store or a warehouse of items, you can transfer inventory from one spot to another, and inventory levels will balance. You can create custom tags for each item and include details in the variants, which makes searching for an item in a large inventory easy in Lightspeed Retail. With simpler inventory management software, you might be able to create purchase orders within the app but submit them individually and manually. In Lightspeed Retail, you can send your vendor information and catalog to Lightspeed to have them upload it into your system, and you’ll be able to set up reorders automatically. Although not typically included in inventory management software, Lightspeed Retail has the POS part ready to go for you to use in your retail store. You can manage your business from employees and sales to work orders and contacts from the software. Also, Lightspeed Retail integrates with QuickBooks so that you can track expenses and revenue more easily. One of the best ways to ensure you’re staying on top of your business’ health is to rely on reports, and Lightspeed Retail offers more than 40 different types. You can run reports on your inventory to see what’s running low, which are your best-selling items, or what hasn’t sold and should be cleared out. 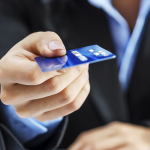 To make Lightspeed Retail work for multiple locations or sales channels, you’ll have to commit to a higher fee. Plus, you’re locked into a year-long contract, so if you find it isn’t the right solution for your inventory management needs, you’ll be out some cash. Overall, Lightspeed Retail reviews are positive, with customers stating they got excellent customer service and the system worked well for their needs. However, Lightspeed Retail is a complex program, so some users said it was difficult to master the back end. Lightspeed Retail combines several features a small business needs, including a POS system, order management, and its inventory management software. If you stick to the core program, it’s an affordable option. Lightspeed Retail offers a free 14-day trial. Sign up for one today. QuickBooks Enterprise is accounting software, but when you add the advanced inventory feature, it becomes powerful inventory management software. It allows you to do more than track inventory, sales, and expenses. There’s bin management, order fulfillment, and insightful reports designed to work well for manufacturers, wholesalers, and retailers that prefer QuickBooks for financials. Although there are several versions of QuickBooks, and some with basic inventory management, you’ll want to choose QuickBooks Enterprise Platinum plan, which comes with the advanced inventory feature. The monthly cost comes out to $191 per user, paid annually, for the cloud-hosted version, which is more expensive than Zoho Inventory, but more affordable than Stitch Labs. The locally hosted version is slightly more affordable ($147/month/user), but you would need your own server, and you can’t access data remotely. Most inventory management software requires you to integrate your accounting software to make it more viable for everyday business, but not so with QuickBooks Enterprise. The advanced inventory tool works well for tracking inventory, sales, and expenses. With the Platinum plan, you’re also able to create automatic pricing rules to apply quantity discounts, promotions, and more, all within your inventory. You can add a photo of any item to your stock, and update inventory counts in real time with the cloud-hosted QuickBooks Enterprise. No matter how many warehouses or locations you have, you can track your inventory in real time with QuickBooks Enterprise in the cloud from a single dashboard. In addition to bin management and bar-coding support, QuickBooks Enterprise also lets you manage sales and order fulfillment, from the point of sale to packing and shipping the product. You can also create purchase orders, bills, and update inventory levels automatically once the product has been received. A new feature in QuickBooks Enterprise Platinum is the ability to set pricing rules, a helpful tool for wholesalers and retailers. Set up a quantity discount across a single category and apply it to all sub-categories. You can customize how those rules should behave, whether the discount should stop at a certain level or increase as quantities purchased do. Create a promotion to offer discounts on a product to customers during a particular week or month, but you can automate it, so you don’t have to remember to go back into the software to start or end promos. Naturally, you would expect a QuickBooks product is going to include accounting, and this Platinum plan is no exception. You can track sales, taxes, expenses, invoices, bills, and more. Plus, you can accept payments within QuickBooks, if you’d like. There’s even asset management, which isn’t typically found in inventory management software. QuickBooks Enterprise offers a variety of helpful reports, so you can reconcile transactions quickly, see customer information, or track sales and expenses. There’s also a forecasting option, so you can predict how your business will do in the future based on historical data. You can also create custom reports, so you can drill down to see the details of your data and choose to analyze what’s most important to you. QuickBooks Enterprise is an expensive inventory management software, which is $191 per month is per user. Plus, it isn’t scalable beyond 30 users. So, it’s more suited for a mid-sized business. Its more affordable options for small businesses aren’t as robust, so it sort of seems like QuickBooks Enterprise is missing a plan level. In many QuickBooks Enterprise reviews, users comment frequently about how easy it is to use the software. The reporting feature gets points from many users as does the inventory feature, especially for warehouse management. The biggest complaints have to do with occasional glitches in the system, such as customer payments not always linking with customer names because of special characters, and the pricing is too expensive for many small business owners. QuickBooks Enterprise is a good combination of accounting and inventory management software that works well for manufacturers, wholesalers, and retailers. You’ll get the powerful tools you need to manage inventory, sales, and financials, along with reporting features. Go to the QuickBooks Enterprise website and sign up for free for 30 days. Get your trial today. 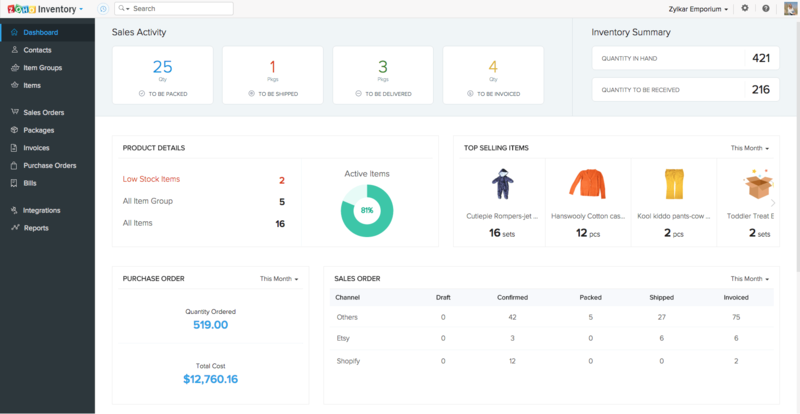 Stitch Labs makes inventory management software that combines all your sales channels together, from retail to online to wholesale, and it’s easy to see where your business stands at any time. The software provides you one place for you to track inventory across all channels, set up automated purchase orders, and forecast future demand. The cost for Stitch Labs isn’t easy to quantify because it’s only on a quote basis. There are three levels, including Basic, High-Growth, and Premium. Basic would work well for a single retail location, but if you plan to integrate 3PL services, first-in, first-out costing (FIFO), and automated order fulfillment from the nearest warehouse to a shipping location, you’ll have to go with a higher tier plan. Estimates for the starting price for Stitch are $499 per month for unlimited users, sales channels, and integrations. You’ll only get up to 2,000 orders, though, and it’s much pricier than Zoho Inventory. In a way, Stitch Labs is like inventory management software and a hub for integrations so that you can manage most of your business from a single app. The automations for purchase orders, fulfillment from the closest warehouse, and order splitting make inventory and sales control much easier for any small business owner. There are also useful reports, integrations, and contact management. 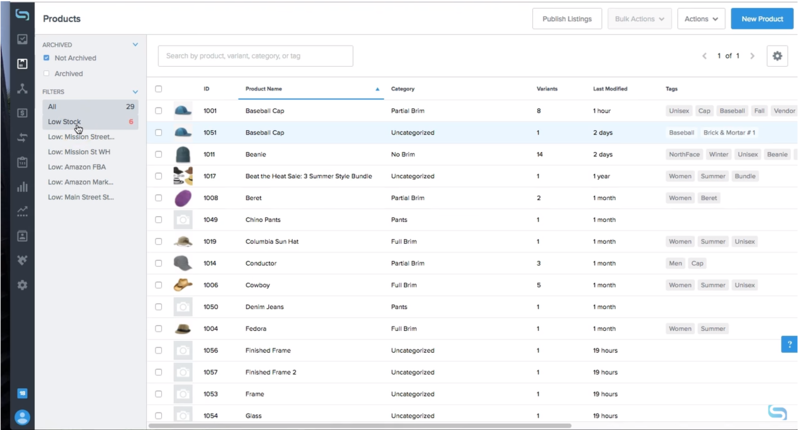 In Stitch Labs, you can apply filters to your inventory to see variables, such as products that are low in stock. When you have multiple sales channels, you need inventory control that can keep up with it, like what Stitch Labs offers. You can track your inventory at any stage, whether it’s at the purchasing stage, sales stage, warehouse transfer, or returns. And all your inventory data is synced across all channels, and it’s updated in real time. One of the best features of Stitch Labs is its automation. 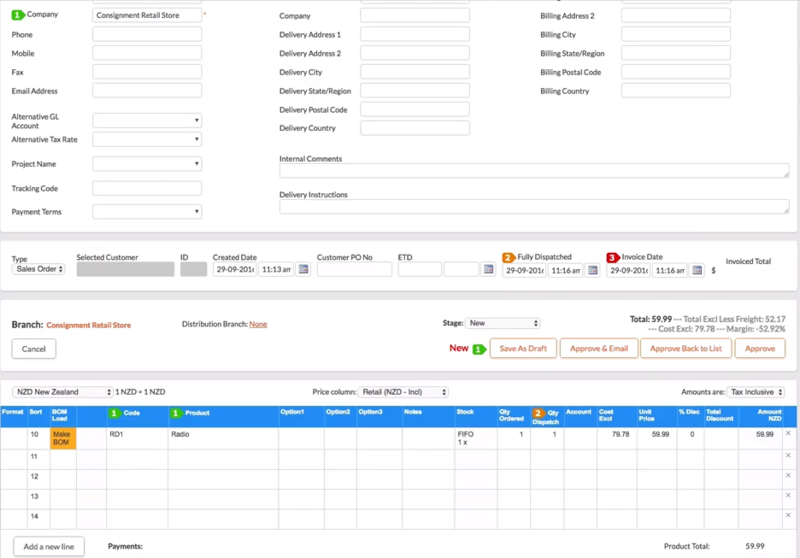 You can set up automatic purchase orders, or even automate the order fulfillment process. When an order comes in, the system can choose the closest warehouse from which a product should ship that’s near the destination. Closely related would be the auto order splitting feature, which will choose the best warehouse based on location and stock supply. Stitch Labs wouldn’t be much of a business hub without important integrations. From common marketplaces like Amazon and Etsy to accounting solutions, such as QuickBooks and Xero, you’ll be able to sell from anywhere and track financials easily. There are also 20 different 3PL providers for you to use with Stitch Labs. You can view reports by the numbers or graphs in Stitch Labs. See sales reports, top sellers, run audits, and analyze group data using a multitude of parameters. Want to see sales by a variant, such as the color green? You can do that. Although Stitch Labs is a good choice as inventory management software for quickly growing companies, it might not be well suited for a new small business as the price is a bit steep. It would also be nice to see some transparency in pricing, so you can know right away whether Stitch Labs is right for you. One of the most common pieces of praise in Stitch Labs reviews is how user-friendly the interface is. It’s intuitive software that’s quick to learn, according to users. Other than its expensive price now, users also noted that Stitch Labs is missing some integrations that would be helpful, such as Squarespace. Stitch Labs is one of the easiest-to-use inventory management software solutions that helps you automate workflows, combine sales channels, and manage various warehouses from one place. It can integrate with various POS systems, accounting programs, and 3PL services too. Head over to Stitch Labs’ website to get started. Request a free demo today. Odoo sets itself apart from other inventory management software mostly due to its open-source nature, which makes this a highly customizable inventory solution. It’s also an affordable option, depending on how many different features you need or want as you choose the modules that work best for your business’ needs. Pricing for Odoo is a little different as your first module is free to use, but each one you tack on will start ramping up costs. For example, if you only wanted to use Odoo Inventory, the app is free, but you’ll have to figure out hosting yourself. If you want more than one or two apps, though, the pricing is $24 per user, per month, and then modules range in price from $12 to $72 per month. Odoo Inventory is $36 per month, which is more affordable than most of the inventory management software on our list. The inventory management software from Odoo focuses on automation to make your life easier, but it also offers customization, so you can get precisely what you need out of the app. There’s nearly every feature you could imagine for inventory control in Odoo, from drop shipping and bin tracking to bill of materials and forecasting. 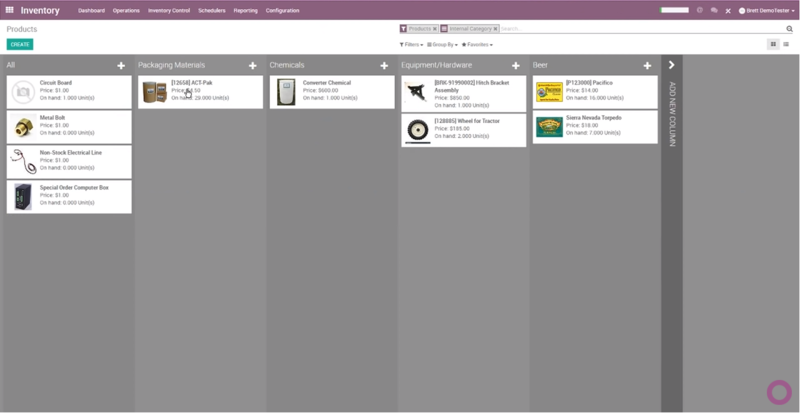 One unique feature of Odoo Inventory is that you can get a linear view of your inventory, or a Kanban view that allows you to drag-and-drop products to different columns or categories. It’s easy to view where your inventory is in the pipeline when using the inventory control methods in Odoo. You can view them in a linear mode that allows you to track movements from supplier to customer automatically, or you can drag-and-drop them items yourself using a Kanban view. To make use of Odoo’s order management features, you’ll need to add on the Purchase app at $12 per month. Combining this module with inventory, you can automate requests for quotes (RFQ) to suppliers for stock, forecast orders for manufacturing, and track all orders. The Sales and Invoicing apps are typically bundled, but they cost $12 each per month, and they let you send quotes and invoices, and you can integrate with almost any other app or marketplace you need. The big draw of Odoo is the level of customization you get in its inventory app. Change the price of variants, if you’d like within the inventory app. For example, say you have a backpack you sell, and blue is a big seller. You can adjust the price of only the blue version by however much you want and keep the other backpacks at the base price to help push overstock. That’s just one example of how detail-oriented you can get with Odoo. To get full functionality, you’ll have to figure out which Odoo apps you’ll need. Plus, you might need to use Zapier to add third-party apps to get a complete package. So, what Odoo is missing is 100 percent completion, but that’s the nature of a module-based program. Plus, the price starts to stack up as you add users and apps, which can make this more expensive than other advanced inventory management software that’s available, like Stitch Labs. Users seem to largely agree in Odoo reviews that this is excellent inventory management software, and the inventory app, in particular, is well designed. It’s an easy-to-use app, as long as you stick to the basics, but if you want to integrate or build for Odoo, users point out that you’ll need developer skills. Odoo is unlike other inventory management software in that it offers a suite of business management tools, but a la carte style. The customization modules are fairly priced as long as you don’t get every single one, and they work well together ― we suggest Inventory, Purchase, and Sales, at least. Odoo charges nothing for the first app you use. Get started at Odoo’s website. Cin7 is inventory management software that automates processes to save you time organizing and maintaining stock across multiple sales channels and warehouses. It’s a powerful system that connects other software you use, purchasing, ecommerce, and retail sales. Cin7 is complex, and onboarding may take some time, but the company offers helpful support. It’s hard to pinpoint what Cin7 will cost for any business because its pricing is by quote only. The one clue the company gives you is on its website: It starts at $299 per month. That monthly price is one of the highest for small business inventory management software, but it’s still less than enterprise-level solutions. The good news is that you’ll get all the same features, regardless of which plan you choose. When it comes to inventory, Cin7 covered all the bases. It can help you manage multiple warehouses and retail shops, plus ecommerce channels if needed. It’s appropriate for manufacturers with its kitting and bill of materials features. Cin7 also supports customer and supplier consignments, which is uncommon. It supports multiple currencies, batch imports, purchase orders, and more, much like Stitch Labs. Cin7’s inventory management is similar to any other inventory software in that you can create your database of inventory one by one, and include a variety of information, from name, code, and variants ― such as color, size, and so on ― stock counts, and costs. You can also organize your stock by store or warehouse and manage it all from one spot. Cin7 allows you to track stock in warehouses by the common first in, first out (FIFO) method, or you can do batch or serial tracking. You can attach a supplier to each product, which helps when it comes time to set up purchase orders. Plus, Cin7 includes a bill of materials (BOM) feature, which isn’t available in all inventory management software, making this an appropriate choice for manufacturers that need to track parts as well as sums. Small businesses that use consignments with customers allow them to sell products for you, but you don’t pay them until the product is sold. In essence, you’ll receive a purchase order from the consignment store for goods sold. Cin7 has a way of handling this specific way of doing business in its inventory management software, while others require you to create a workaround. Cin7 includes a feature specifically for businesses to manage consignments and inventory. The dashboard in Cin7 gives you a snapshot of your inventory levels, cost of goods sold (COGS), and your top-selling products. There are nearly as many preset reports in Cin7 as there are in Lightspeed Retail so that you can generate a report quickly to see the specifics of sales in a given period, which helps with forecasting. It also helps that Cin7 integrates easily with software like QuickBooks and Xero, Shopify, Amazon, eBay, and various retailers and 3PL companies. Although Cin7 seems like complete inventory management software, it is missing a working drop-ship function, which is available with Zoho Inventory, and the system crashes often ― not regularly, but often. It’s also outside of many small businesses’ budgets. A system that starts at $299 isn’t likely to work for many startups unless it can replace most other software needs, which this does not. For the most part, Cin7 reviews are positive from users. It seems that the development team has made vast improvements during the past two years because users are commenting about how the helpful the after-sales support team is as there were negative reviews from the past and that patches are being made to fix issues. The biggest complaint comes from small business owners that liked what they saw during their free trial but cannot afford the monthly cost. Cin7 is a comprehensive and feature-rich inventory management software that can help you connect all the dots for your warehouses, retail locations, ecommerce sales channels, accounting, and more. 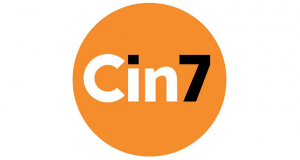 You can try Cin7 for free by simply visiting its website and filling out a short form. Try it free today. Inventory management software can help you organize and manage your stock in warehouses, in retail stores, and through various other sales channels more easily than the pen-and-paper method or spreadsheets. Valuable data becomes useful for forecasting, stopping gaps, and knowing exactly how your business is doing. Zoho Inventory is our pick for the best inventory management software for small business because it’s simple to set up and use, it integrates well with several other apps, updates in real time, and it’s affordable. Try Zoho Inventory free today. Very nice article, but I don’t think you give Quickbooks Enterprise Solutions with Advanced Inventory a fair shake. You fail to mention some very nice quality of Quickbooks Enterprise Solutions with Advanced Inventory including that you only need 1 program with Quickbooks. You don’t mention with Lightspeed Retail that you still need to purchase Lightspeed Accounting in order to communicate with Quickbooks or other accounting system. You need 3 systems with Lightspeed verses one with Quickbooks Enterprise Solution. You also do not mention that Lightspeed Retail; Lightspeed Accounting and Quickbooks all need to be open at the same time to have everything sync together. I’m in the process of changing from Quickbooks Enterprise Solution with Advanced Inventory to Lightspeed Retail and I’m finding that there are many things Lightspeed cannot do that Quickbooks can. I don’t feel Ligthspeed that is intuitive. I have been on the phone with Lightspeed Retail’s customer service for over 7 hours now; and every questions has been answered with “Lightspeed cannot do that”. Each system definitely has pros and cons. Lightspeed is a good inventory system with a very strong in-store POS which you have to purchase separately to use QuickBooks for in-store checkout. If you primarily need QuickBooks’ accounting and inventory features and the POS isn’t the main driver, then QuickBooks’ solution is probably the best for you. It sounds like you were able to sort out the best solution for your needs in QuickBooks. Thanks for taking the time to comment. Nicely written an article about the accounting software, Thanks for sharing your knowledge. Lightspeed POS - FREE Trial! Try Lightspeed POS System for FREE!